In art, “value” refers to the relative lightness or darkness of a given color. Lighter colors are said to have higher value, and darker colors lower value. 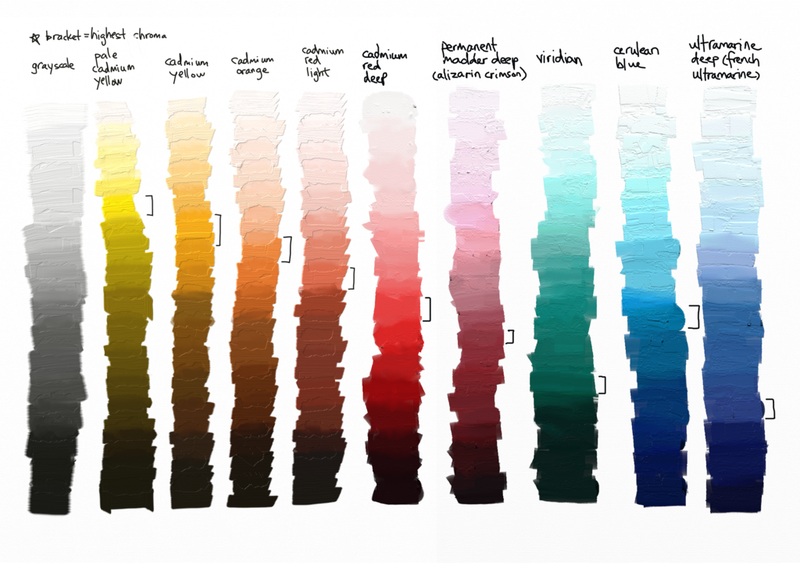 “Tone” is a very similar concept to value, and refers specifically to the intensity of a color. Adding white or black to a color will change its value (lightness or darkness) by also changing its intensity. The more pure the color, the more intense. 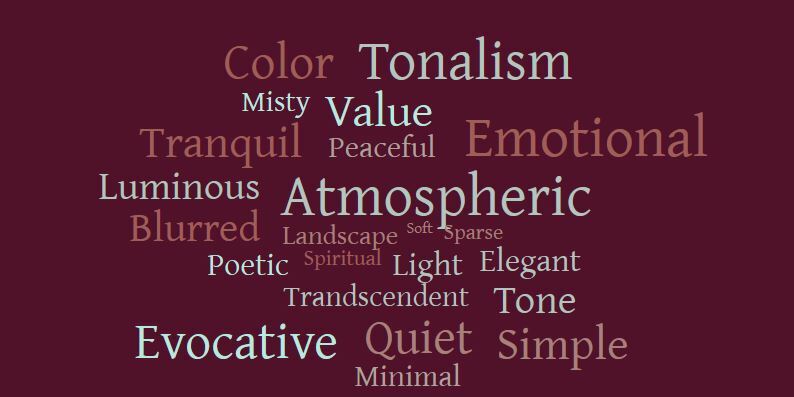 Therefore, the mid-value and mid-tone colors used by Tonalists end up reading as very soft and quiet. “Tonalism” is the name that was eventually given to the art movement popularized in the late 1800’s by American landscape painters. Essentially, Tonalism is a way of painting landscapes that is characterized by soft, blurred lines, gentle use of colors in the mid-range of tones and values, and an elegantly simple composition. For many Tonalist painters, the use of this style was inspired by the philosophers and Transcendentalist ideas popular in America at the time Tonalism began. By painting a landscape in this certain way, artists sought to transform the portrayal of a landscape into something that might elicit a spirit of contemplation and introspection from the viewer, turning it into a tranquil and meditative device. An early member of the Tonalist movement, Birge Harrison, once described the objective to his students as that of striving for the “big vision-the power to see and to render the whole of a given scene, rather than to paint a still-life picture of its component parts; the power to aint the atmosphere that surrounds the objects rather than the objects themselves; the power, in one word, to give the mood of a motive rather than the scientific statement of the trees and rocks and fields and mountains that make up the elements.” Tonalism took many varied forms in the work of different artists, but here’s a word cloud to help give you an idea of the common qualities of Tonalist paintings. Inspired by the Transcendentalist philosophies of writers like Henry David Thoreau, Ralph Waldo Emerson, and Walt Whitman, American landscape painters in the late 19th century developed the progressive and spiritual style of painting known as Tonalism. Two well-known artists from this movement were George Inness and James Abbott McNeill Whistler. Both Inness and Whistler experimented with the use of Tonalist qualities such as soft, mid-tone colors, simplified compositions, gentle light, and blurred focus to create contemplative, peaceful scenes like these below. Tonalism continued to inspire painters in later movements as well, as one can see in the work of more modern masters like Andrew Wyeth (and, as we’ll soon see, Principle Gallery artist Kevin Fitzgerald). To give a quick visual example of how effective Tonalist techniques are in creating a peaceful, moody atmosphere in a painting, let’s take a look at two lovely landscapes by Principle Gallery artists. On the left, Lisa Noonis has used higher-contrasting values and colors and energetic brushstrokes to give this water scene a lively and dynamic feel. 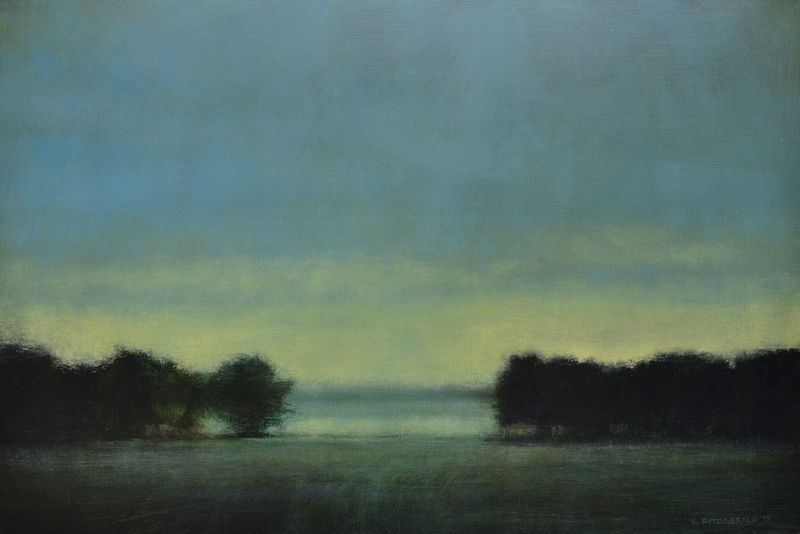 You can easily observe, though, how on the right, Kevin Fitzgerald’s Tonalist-inspired landscape (while it shares some of the basic characteristics of Lisa’s painting) makes use of the principles of Tonalism to achieve a poetic and tranquil effect. Both of these artworks depict sky, clouds, and water using a range of blues, greens, and grays, but it’s easy to observe how different the resulting “feel” is between the two. 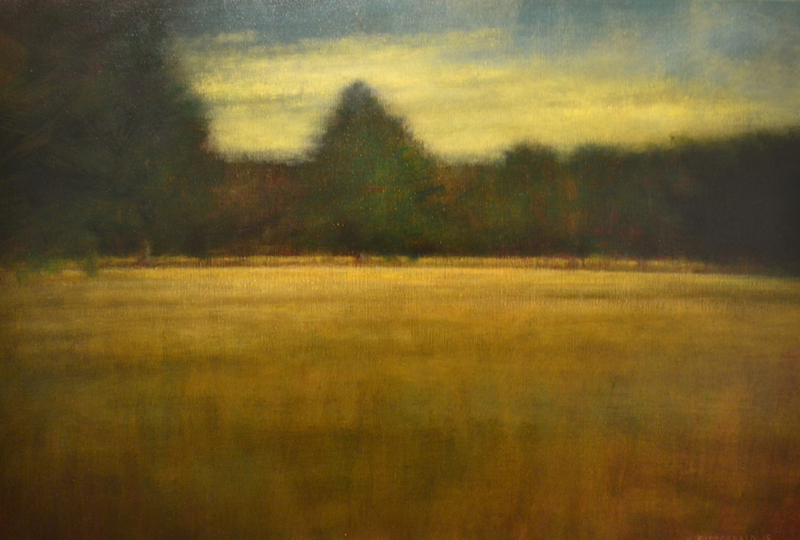 Inspired by a wide range of artists, from Renaissance Masters, to Tonalists, to the French Impressionists, to color field painters like Mark Rothko, Kevin Fitzgerald has developed his own style of painting landscapes in a way that, like Tonalism, transforms the scenes into something that the viewer experiences emotionally as well as visually. 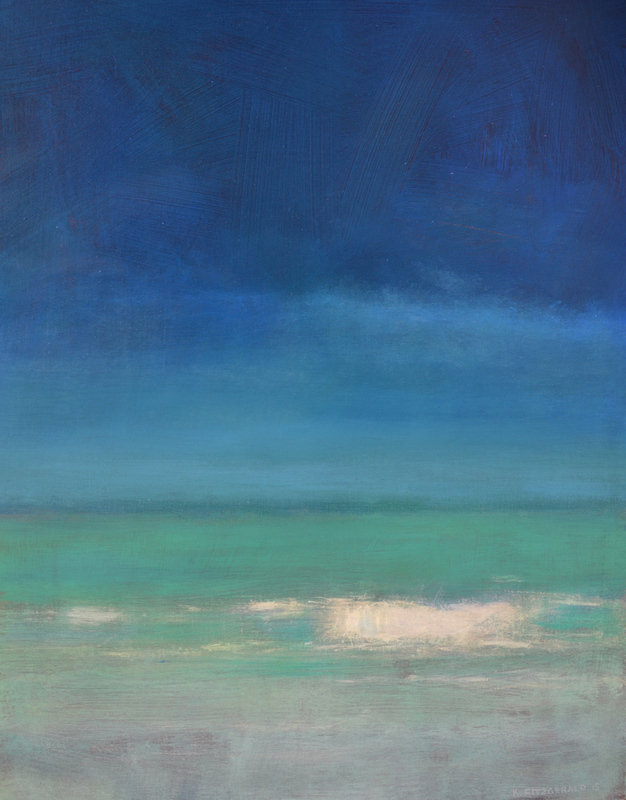 Kevin uses the vistas that he paints, often near his home on the Eastern Shore of Maryland, as a poetic means of communicating the spiritual significance of each moment in nature. We are thrilled to be anticipating the opening of Kevin’s annual solo exhibition this coming Friday, March 20th. Join us from 6:30 to 9 PM at the gallery to view these amazing works of art, meet the artist himself, and maybe even find your own moment of comtemplation and peace. 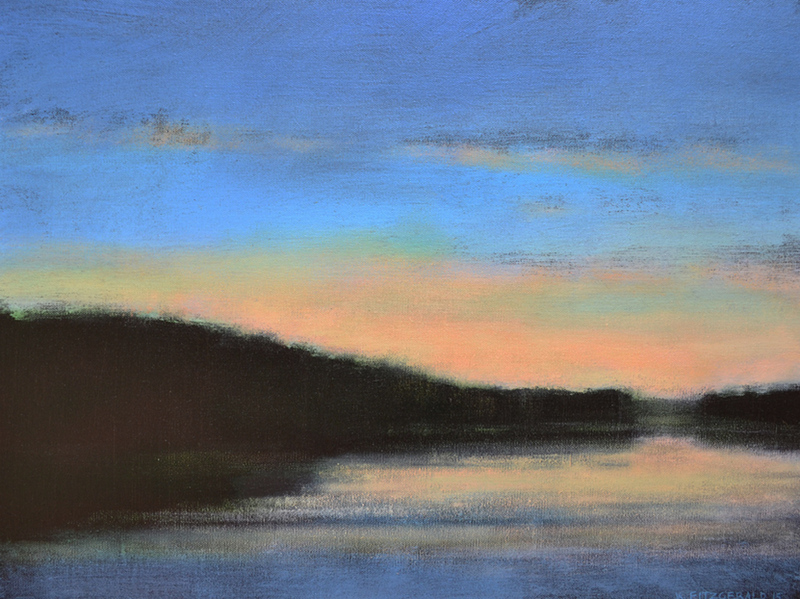 Enjoy this sneak peek of some of the beautiful, Tonalist-inspired landscapes in the show! For a full digital preview of the exhibition, just send an email request to info@principlegallery.com, or keep an eye on Kevin’s artist page on our website for other available works. Reblogged this on Larry Zink Watercolors.